One year ago we launched Workshape.io into public beta. We were not ready, but thought we had the start of a good idea and wanted to find out what the world might think about it. We never imagined that just 12 months later we would be nominated for industry awards from 2 separate industry bodies: Best Newcomer 2015 and Best Innovation 2015 at the National Online Recruitment Awards, and as one of 5 finalists at the Europe HRO iTalent 2015 competition for tech innovation in the talent space. 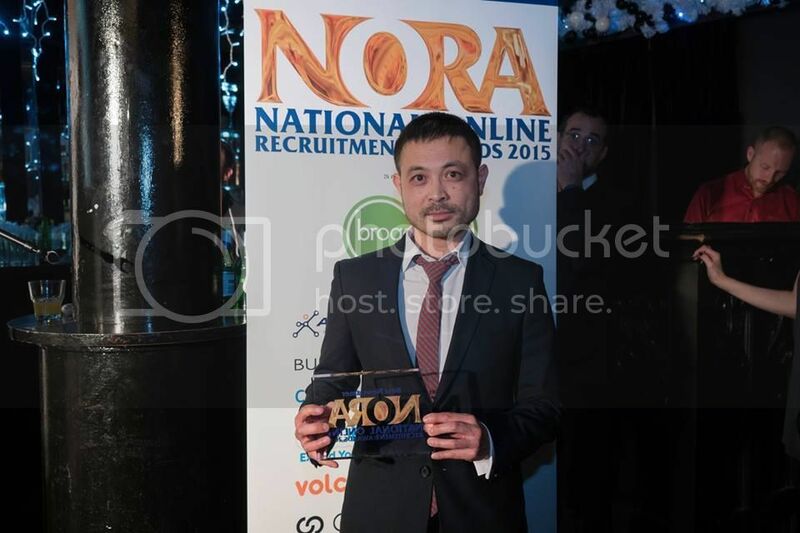 Even further from our imagination was that we might actually win one of them, which we did for Best Newcomer at the 2015 NORA's, voted for by over 25,000 people from amongst 600 recruitment tech services. It was huge honour, a humbling experience and a very welcome surprise! You can see how unprepared we were from the terrible acceptance speech I gave and, in this photo, where I am holding the trophy the wrong way round for the cameras. It's been an incredible journey for us so far. And so we need to write this post to give credit where it is due. This moment also gives us the opportunity to update you on our current progress and to restate our ambition: of minimising the pain of recruiting by focusing more on what people want to do in the near future, rather than what they have done in the past, and visualising that sentiment in the form of time signatures of work, presented as Workshapes. As a bootstrapped Startup, we are keenly aware that no project of work gets very far without the support of others. Since launch, we have been overwhelmed by goodwill given to us from people from every part of our lives. There are too many to mention in one post, but some of you are going to get a namecheck because your support has been down right conspicuous! To all our friends in #Startup, you've been amazing. Dimitar Stanimiroff, Kevin Rooney, Zack Bleach, Kes Thygesen, Stephan von Perger, Roger Toor, Marie Steinthaler, Abakar Byron Saidov, Celso Pinto, Christopher Kahler, Rick Tank, all of the RethinkDB crew, especially the wonderful Christina Keelan - this means you. To the recruitment pro's who have not only been super users of the service, but powerful advocates for us: Anna Ott, Kasia Borowicz, James Peters, Matt Buckland, Tris Revill, Willem Wijnans - would could not have gone this far without your support! To the people in the talent industry who share with us a desire to make recruitment better: Matt Charney, Oscar Mager, George LaRocque, Jacob Sten Madsen, René Bolier, Keith Robinson, Andy Headworth, William Tincup, Dominic Lüdin, Jamie Leonard, Marc Coleman, John Sumser, Rob Long, Bill Boorman. And to friends and family whose support we could rely on, but have searched for additional reasons to help: Anne-Marie Tomchak, David Tomchak, Charlie Moretti, Wai-Ming Lee & Fiona Dent - this means you. Finally and not least of all, to 400+ companies who have used our service, the 60+ who have become paying customers since we came out of beta 5 months ago and the thousands of developers who have signed up from all over the world. You are using Workshape to discover people and opportunity, providing us with amazing feeding back and encouraging us every step of the way.